mine looks like a whale! Years ago I read about Aspergers and I identified with a lot of it, but then I read about Social Phobia which seemed to fit more so when I finally went to the doctor that's what I told her I had, that's what I got diagnosed with and it's what I've had psychotherapy for. But a few months ago I was being assessed for further therapy and the therapist drew a large imaginary question mark in the air and said she wondered if I had Aspergers, and now I'm waiting to be assessed for it. My current thinking is I have Aspergers which has lead to Social Anxiety. Innit. ^I certainly think my social anxiety was triggered by negative peer reactions to aspergic/non verbal learning disorder traits. I think aspergers/nvld with SA or SA with aspergers/nvld(depending on which is dominant) is probably more disabling than SA alone. I do think how you score can be influenced by how positively you answer the questions . This was the same test I did in 2015. It no doubt reflects different levels of certainty as to the aspergic traits . The true picture probably lies in the middle. Interesting though I have no idea what it means! Location: The West of England. Interesting... I seem to be in a minority here! This and the recent thread about women with Aspergers have been a bit of an eye opener. In all my years of getting help for mental problems, AS has never been mentioned as a possibility. But the more I read about it lately, the more it makes sense and could explain some things that have always puzzled me. E.g. I find empathy difficult (although I'm better than I used to be ) and find it hard to read facial expressions (one of the worst things for me). I don't make very much eye contact, even with family and close friends. I'm slightly better in social situations than I used to be, but this is from observing what other people do and copying their behaviour. I'm fairly set in my ways and hate for my routine to be disturbed in any way. My OH says I should talk to my doctor, has anyone done this and were they helpful? What sort of help (if any) is on offer for adults diagnosed with AS? 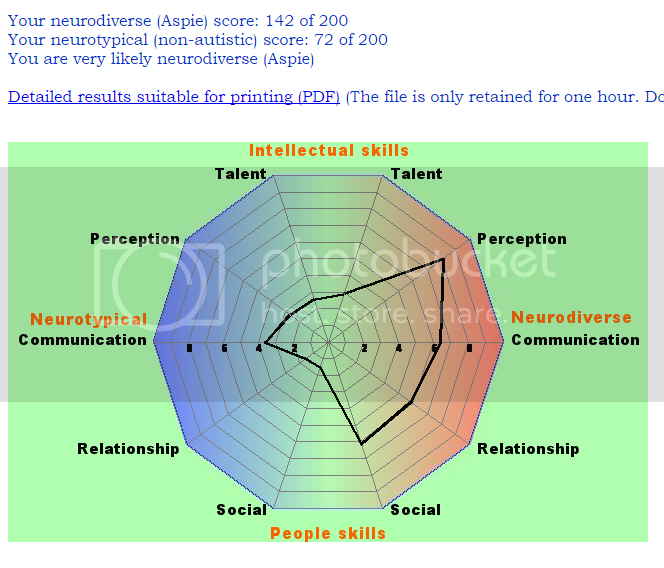 Diagnosed aspie here, but I do have some neurotypical traits. I'm currently reading a book called 'Guerilla Aspies' by Paul Wady, which attempts to show aspies how they can fake neurotypicalism. I did the test yesterday and came out mixed neurotypical and neurodiverse. It didn't surprise me tbh. 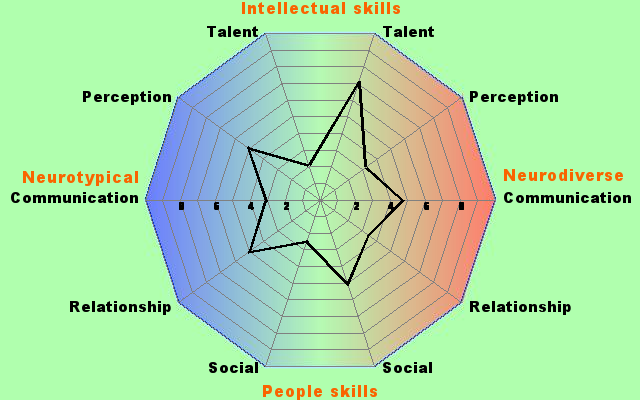 I don't think I'm on the autistic spectrum but I definitely have tendencies that way in terms of communicating with people etc. I actually had the same question. I've had a few people tell me I should 'go and see someone' but from what I can tell it's a long, tedious process that can go on for years and at the end they still might not have an answer. I'm not sure I could make a good case for seeing a therapist on the NHS and tbh I'm not sure I'd want to, I'd feel like I was wasting their time. I was wondering if anyone had found it useful looking for help though and my graph is kinda, uh, in the red.